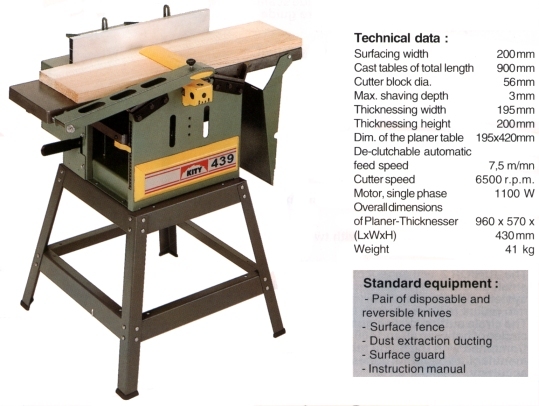 JUNIOR 3k allows you to plane rough sawn timber or pre-used timber, smooth straight and square. Its advanced design is the guarantee of quality, safety and reliability. With surface table dimensions of 900 x 200 mm, and a thicknessing capacity of 195 x 200 mm, the JUNIOR 3k is a small machine with big capacities. JUNIOR 3k comes equipped with a two knife dynamically balanced cutter block, to ensure a regular finish and vibration free running. Built with a casing of re-enforced steel, the machine offers both strength and rigidity while still retaining a low weight for maximum portability. With fully de-clutchable feed rollers, the JUNIOR 3k can be changed almost instantly from surface planing to thicknessing. The JUNIOR 3k is equipped to accept a purpose made slot mortise attachment. 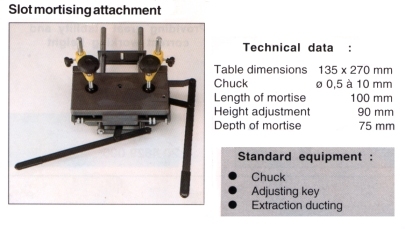 With an anodised cast aluminium table, heavily ribbed table construction and calibrated guide system, it's the ideal accessory for all your morticing requirements. For optimum workshop cleanliness, the JUNIOR 3k comes complete with chip extraction ducting that complies with the latest health and safety requirements.